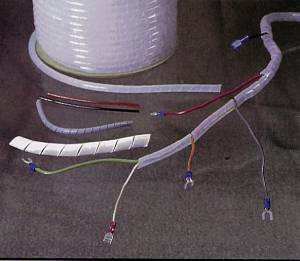 Harnesscoil is a flexible wrap that forms a firm, abrasion protecting bundle around wire/cable, hydraulic lines or wherever protection is warranted. It is ideal for organizing under desk computer cables. It twists on easily and allows lead-outs or additions at any point. Harnesscoil will not damage the outer insulation of wires or hydraulic lines. The interior surface is ridged to "grip" the wire bundle . Installed, it may be gapped for greater economy and flexibility or butted tightly for insulation protection and greater rigidity. Harnesscoil is abrasion-resistant, moisture-proof, non-staining, non-toxic, and highly resistant to most acids, alkalies, grease and oil at ordinary temperatures. Installation is achieved without the aid of a tool. In special dust-proof "feed-out" boxes that simplify dispensing, handling, application, and storage. Harnesscoil is available in boxes of 25, 50, and 100 foot lengths. Spools are available in 250 and 500 foot lengths.